Valor training camp, presented by Athletic Performance Inc. (API), opened Saturday, April 6, as the team begins preparation for the 2019 season. The Valor's 35-man training camp roster features both returning contributors, like ArenaBowl XXXI MVP Arvell Nelson and starting linebacker Jimmy Gordon, and new faces, like veteran defensive back Trey Wolfe and rookie wideout Dezmon Epps. Read what head coach Benji McDowell and a number of players had to say about camp, the offseason and goals for the season HERE. "It feels great to be back in camp. I've been itching since the ArenaBowl last season. For five or six months, guys have been thirsty to get back out here. It feels great. Guys were flying around today. It's a good sign that the boys came in here in shape and ready to work." "The focus is just to get better every day. If we can string together days where everybody gets just a little bit better, by the end of it, we just keep going up. By game number one, we're clicking on all cylinders." The AFL officially unveiled new uniforms for their 2019 season during a press conference at the Capital One Arena in Washington D.C. For the custom design and production of the new uniforms, the AFL partnered with Phenom Elite, an up-and-coming manufacturer of high-quality uniforms and apparel. 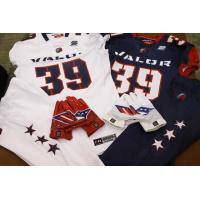 Media interested in covering the Valor this season must request credentials by emailing aflcredentials@monumentalsports.com at least 24 hours prior to the start of the game or practice.